RHINO offers two basic products for steel building insulation. Both of these metal building insulation options are easily installed and offer big savings in energy costs. The first option is fiberglass insulation from 3″ to 8″ thick, providing for R-10 to R-30 energy ratings. This fiberglass insulation for metal buildings has a reinforced backing, eliminating the need for chicken wire support— saving you labor and money. The second steel building insulation option is definitely the best choice for environmentally-conscious (and money-conscious) customers who demand superior performance with long-term energy savings: RHINO’s premium Pro-Value Insulation Package. With this four part, premium grade insulation for metal buildings you will reap maximum energy savings. The initial investment will be quickly recovered by saving as much as 50% on your building’s utility bills using our superior Insulation for Steel Buildings. Plus, you’ll have the added satisfaction of knowing you are doing something good for the environment by conserving energy. This makes our insulation liner systems ideal for garages, barns, and more. Our steel building systems create much deeper walls than other framing materials and allow for better steel building insulation options. Because the steel building insulation is not compressed in RHINO buildings, nearly the full R-value is realized. It is easy to see the potential increase in energy efficiency and savings by examining the chart above. 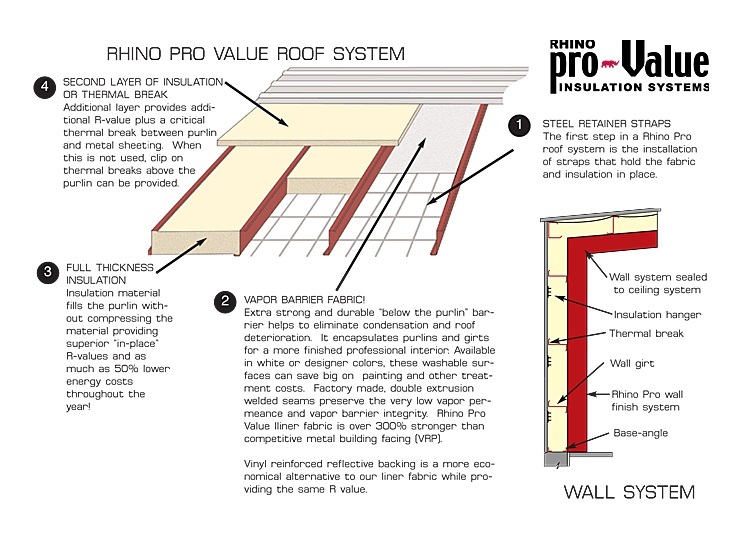 RHINO Pro-Value packages are available in R-19 to R-30 for walls and R-20 to R-40 roof systems. Completely filling the purlin and girt cavities with insulation for metal buildings is highly recommended for optimum energy savings. Superior “in-place” R-values for both roof and wall cavities, with no steel building insulation compression or voids. Significant long-term savings on energy cost and HVAC and lighting utility investments. Below the purlin vapor barrier helps to prevent condensation and brightens interiors. No stapled or gravity seams are necessary. Extends building life and lowers maintenance. Insulation for metal buildings saves as much as 50% on energy consumption. Share the post "Metal Building Insulation"